Information is power, and lack of access to it can keep people and communities vulnerable. Breaking these barriers is where communications designer Jessica Bellamy, founder of the Louisville, Kentucky-based Grassroots Information Design Studio (GRIDS), has found her calling. Bellamy and her staffer Daphne Walker are focusing their award-winning design skills into GRIDS’ mission to “better disseminate information, as well as create [socially] conscious perspectives of data” — in other words, help non-profits and community-led organizations communicate important information to funders, policymakers, and the people they serve with smart, accessible infographics. Bellamy also works with organizations to adopt easy-to-use design software, empowering them to do some of this work themselves. 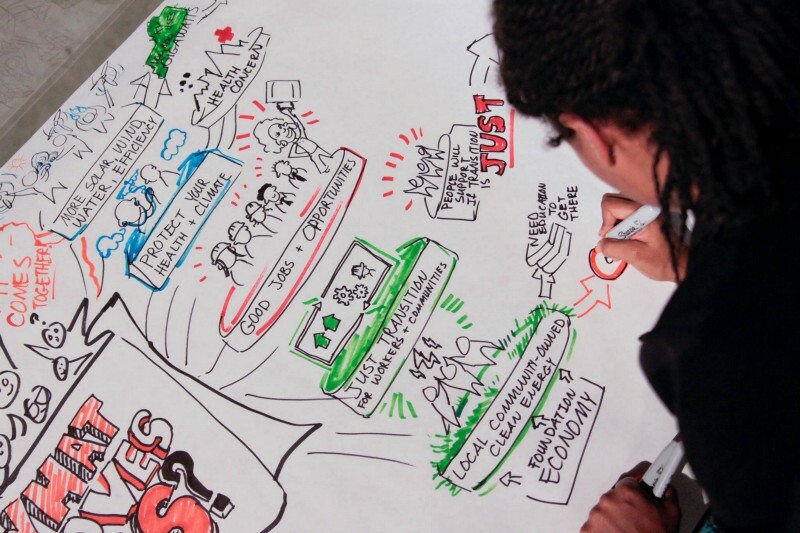 Bellamy was the graphic facilitator of the Empower Kentucky Summit, where she illustrated feedback from summit participants on a variety of topics such as racial and environmental justice. Bellamy says the idea for GRIDS came to her when a report she designed in a previous role for a statewide community-based organization empowered a member of Louisville’s Smoketown neighborhood. For Bellamy, this was affirmation that design makes all the difference. She’d been the one who’d originally suggested the organization she was working for use the data and information they’d gathered to create an infographic that would turn boring text into easily digestible information. That moment Bellamy witnessed someone wielding one of her infographics made her decide to leave her stable job and see how she could scale the idea. Bellamy was selected as a 2017 Design Disruptor Fellow by the UnSchool, which describes itself as “an experimental knowledge lab for creative rebels and change agents.” And she was able to bring on Walker, who won a record-breaking five awards at this year’s Louie Awards for graphic design and advertising held by the local chapter of the American Advertising Federation. Going forward, GRIDS’ work will be more important than ever. Government changes on the national and state level have created an influx of information that needs to be relayed to the community. It’s one of the reasons Bellamy is excited about websites and apps like Wix or Squarespace, or online photo editors like BeFunky, that make it easier for community organizers to be designers and edit their own communications instead of needing to pay someone to do it. It’s been 10 years since Bellamy helped collect the data for the report that sparked her vision for GRIDS. And in a time when more people than ever are hitting the streets to enact societal change, Bellamy reminds us that when we go into communities outside of our own, we must put the wants and needs of the community first or risk failure. Minda Honey remembers the pre-Photoshop days when MS Paint was all you needed to wow your friends with your digital art skills.